Turkish prosecutors want a policeman to go to jail for three years for tear-gassing a protester who became known as the "woman in red", reports say. Fatih Zengin is accused of using excessive force against Ceyda Sungur, who was standing a short distance away and not behaving aggressively. 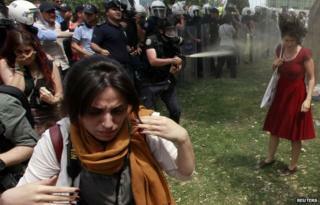 Ms Sungur became a symbol of last summer's anti-government protests after images of the attack went viral. At least six people died and thousands were hurt in a government crackdown. The prosecutors want Mr Zengin's dismissal and a prison sentence on the grounds that no warning was issued prior to the incident, Turkish news agencies reported. The protests began as a peaceful demonstration against plans to redevelop Istanbul's Gezi park - one of the last green spaces in the city. But they escalated into an unprecedented show of defiance against Prime Minister Recep Tayyip Erdogan and his government after a heavy-handed police operation to clear the site. 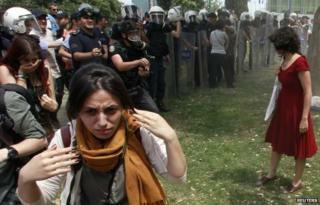 Ms Sungur, an academic at Istanbul's Technical University who was wearing the red dress, had gone to join the protests but found herself in front of a line of riot police. One of them bent down and fired tear gas at her, leaving her gasping for breath. Reuters photographer Osman Orsal captured the moment, and the images soon went viral on social media, in cartoons and as stickers and posters used by other protesters.